Sometime in the nineties, I visited an ordinary house in Secunderabad. I was received with a lovely smile and made to feel welcome by a little boy who said “Hello aunty, Namaste. Please sit down, Manjula madam will come soon.” I sat at the entrance lounge and noticed that the reception desk was managed by a young girl who was also answering the phone in a businesslike manner but was very friendly and polite. Both the ‘lobby managers’ answered all my queries pleasantly and offered me a glass of water, properly served. There were a few other youngsters of different ages around who went about their jobs with a cheery greeting to me. Helping the cook with vegetables; the invariable cleaning of rice and dhal; sweeping and mopping; dusting and bed making were some of the duties they handled by rotation. This was no ordinary house. 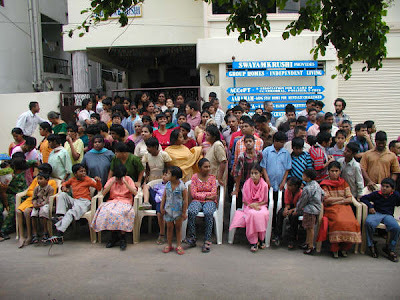 It was Swayamkrushi, a community based project for the mentally challenged, started by Manjula Kalyan, a dynamic, motherly woman who had always been interested in helping the developmentally disabled. Her goal is to give them an equal seat at the table and a chance to face life’s challenges from a position of strength. To integrate them into neighborhoods, she rents small homes and houses a small group of incumbents with a resident staff member. She takes her flock to visit the neighbors. Explaining their objectives, she asks them to accept and welcome them as friends to be included in local activities and festival celebrations. The response has always been encouraging. In some instances, the neighbors have helped by standing by these unique families in times of a water shortage or power breakdown. They provide services like wet grinding of batter and flour milling. The necessary grinding and milling machines have been obtained as donations. The neighboring shops have also pitched in by providing employment. The local vegetable dealer allows them to sell vegetables in the evening in his shop. This helps them to hone their public relations skills while also building basic business acumen. I wanted to give them a treat and Manjula suggested that we buy ice cream from the shop near by. Three of them took down everyone’s order and went out to make the purchase, making alternate flavor decisions if something was not available. I was quite impressed at how well they handled the purchase, the transport, the distribution and the cash transaction. The cheery thanks and farewell that I received that day has etched the whole experience in my memory. At that time they were only 8 in number. Today Swayamkrishi has grown exponentially in both size and reputation. Swayamkrushi means self help. The twin objectives of the institution are rehabilitation and mainstreaming. The idea is to provide supervision and training so that the individuals are able to achieve self sustenance both economically and socio-culturally. Self, home and money management skills, how to travel independently, the pursuit of leisure and sport activities, elementary reading and writing, speech therapy and verbal exercises are all part of the curriculum. Nurturing these special people as tenderly as a parent Swayamkrushi makes them ready for the world even assisting in placing them in suitable jobs once they have successfully completed the program. Swayamkrushi has received many accolades and awards earning high praise from visitors and sponsors. It is represented in the Bay Area by SK Foundation, a low overhead non profit organization whose principal activity is fund raising. Visit their website to find out for yourself how this wonderful institution has enriched the lives of many. You will be inspired to contribute and make a difference. Translated from Telugu is the beautiful and touching Swayamkrushi theme song proudly sung by the accomplished members of the institution; We are from a different world, distant from yours. We are children of this other world, we will remain ever innocent. We are buds that have forgotten to bloom. We are birds that have not sprouted wings. We belong to the same caste, We are Innocents, we have no differences. We are grown up children, It is unfair to call us a burden to your world! To call us incompetent and to keep us away, Is that not unfair to us? Come closer to our world, Till we learn to walk steadily. Reach out your hand. Give us a little time. A kind word from you Is all that we need. This entry was posted in Good Samaritans and tagged charity in india on July 20, 2007 by vpdot. Reading the poem brought tears to my eyes…. Malatiji, thank you very much for writing about this organization and about the wonderful work that are doing. Certain schools in the bay area have a program which mandate high school kids to volunteer at least 16 hours working with the developmentally disadvantaged prior to their graduation. My son, 14, recently spent some time working with mentally challenged adults at the Agnews Development Center in San Jose. It was an eye opening experience, one which I think has created an awareness and sensitivity to the needs of the “children of the other world”. I wonder if Swayamkrushi would be interested in implementing a similar program with local high schools and colleges..